Apricot and almond tart | dash.drizzle.dollop.devour. I cannot resist the abundance of fruit that appears during the brief summer months. My shopping basket is crammed with punnets of nectarines, apricots, raspberries, strawberries, cherries; mostly destined to be devoured by the handful, loitering by the open fridge door. I have a bit of a love-hate relationship with apricots. I’ve always found dried apricots to be a total abomination, their flavour resembling that of shrivelled up cold teabags. And fresh apricots can seldom be caught at that perfect point of ripeness. I am often seduced by a blushing, fresh fruit only to discover that the pretty soft skin is disguising a dry and woolly interior. For me, the magic only truly happens when you cook an apricot. Suddenly they are gloriously transformed into everything you always hoped they would be – fragrant and juicy, with sweet, tender honey flavoured flesh. Almonds are the perfect partner to so many summer fruits and apricots are no exception. The two combine beautifully in this nutty, moist tart; lovely after dinner with a scoop of vanilla ice cream or stashed in a cake tin for those mid-afternoon munchies. This isn’t the quickest of recipes to put together. Whilst your actual time in the kitchen isn’t excessive, there are a couple of points when you need to let things rest for an hour or two before proceeding. However, this makes it possible to make the various components in stages over a few evenings, not to mention that the finished tart will keep well for a few days. For that reason, this is a good pudding to make in advance if you are having people over to eat. And I am a definite believer in recipes I can prepare ahead if I have guests. I am a supremely messy cook, which does not work at all well with an open plan kitchen. Much better to serenely conjure a tart out of a tin amidst a pristine kitchen, with no traces of the clouds of flour, sticky handprints and splodges of sauce that the preparation invariably entailed. Step 1 is the pastry, which, once made, will need to rest for at least an hour before rolling. I made mine a day ahead and just left it in the fridge until needed. Weigh 250g plain flour and sift into a bowl. Add 50g icing sugar and a generous pinch of salt and stir to combine. Cut 125g cold butter into 1cm cubes and tip into the flour. Gently rub the flour into the butter until it has the texture of fine breadcrumbs. Try not to overwork it too much. Then mix 1 egg with 1 tbsp milk, add to the flour mix and stir together to form a soft dough. Knead together briefly, just enough to form the dough into a ball, then wrap in clingfilm and refrigerate for at least 1 hour. Once chilled, lightly flour your work surface and roll the pastry out thinly. Line a 22cm tart tin, being sure to press the pastry into the corners and fluted tart edges. This is more pastry than you will need to line the tin, but a pastry recipe demanding ¾ egg would just be silly. Place the lined tin in the freezer for at least an hour. Again this would be fine overnight. I normally make little biscuits with my leftover pastry, just cutting out little shapes, dredging them with cinnamon and brown sugar and baking for 10-15 minutes alongside the tart. The next step is to prepare the fillings. 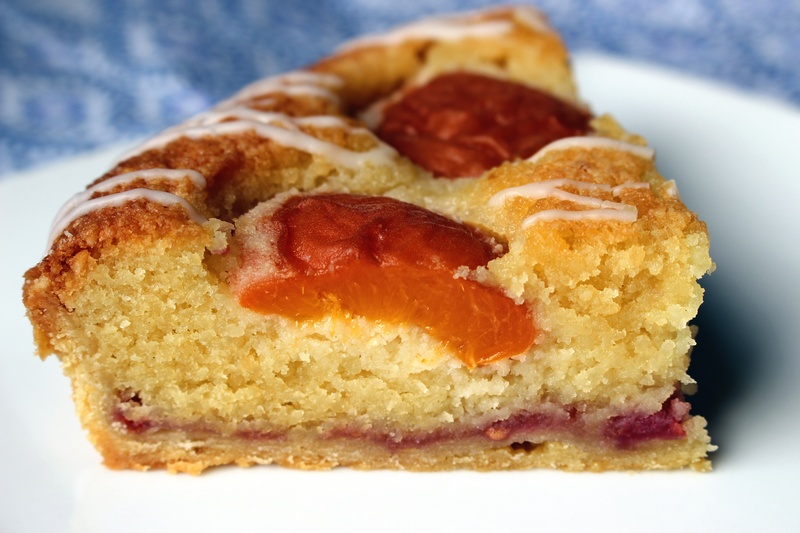 At the bottom of the pastry case is a scant layer of raspberry jam, topped with a thick layer of moist almond frangipane topping, with halved apricots sitting on top of that. I made my own fresh raspberry sauce but a couple of spoonfuls of ready made raspberry jam would be absolutely fine. If you want to make a fresh sauce, tip 200g raspberries into a small saucepan, squish them a bit and add 3 tbsp sugar. Then simmer for 5-10mins until you have a thickish sauce. For the frangipane filling, put 165g softened/room temperature butter into a bowl and beat lightly. Then add 165g caster sugar and beat until light and fluffy – about 5 minutes. You can do this in a machine, but sometimes its nice to do it by hand with a wooden spoon. You really can’t beat it too much at this stage. Add 2 eggs, lightly beaten, and 2tbsp amaretto (optional). Again, beat together thoroughly. Then fold in 200g ground almonds and then place the mixture in the fridge until you are ready to use it. When you are ready to cook your tart, preheat the oven to 160C and bake the pastry case, straight from the freezer, for 10mins. If the pastry rises at all, prick with a fork and press down, then spread over a thin layer of the raspberry jam. Top with the frangipane. The frangipane will be quite thick after chilling, so rather than tipping the whole lot into the middle and spreading it out, I like to dollop spoonfuls around the edge and spread gently to make sure there are no gaps between the filling and the pastry for jam to bubble up through. Once the edge is sealed, use the remainder to cover the centre of the tart. Halve 10-12 apricots and pack them quite tightly on top of the frangipane, pressing down gently to embed them a little. The frangipane will rise around them and the apricots will shrink, so squeeze in as many as you can. Bake for 50mins to 1 hour, until golden and firm to touch. Once cooled, you may wish to drizzle over a little icing. Make a nice thick icing from 2-3 tbsp of icing sugar and a few drops of water and dribble over artistically. I was lucky enough to eat the Apricot and Almond Tart on Friday and can confirm it was fantastic!